The market is very high as you know. It's not as though these things are a surprise, that's one reason I'm worried about markets in many parts of the world. The American stock markets are trading at an all-time high. Most of the markets in Europe are trading at all-time highs. I don't like buying when things are making all-time highs. I'm not buying anything right now me here I'm worried about what's happening in the world the world is overdue for a correction and maybe a big correction so at the moment I'm sitting and watching and waiting to see what happen. Read Jim Rogers’ latest interview with RT.com here. Jim discussed several topics including how China, Russia and Iran are planning to move away from the U.S. Dollar creating a new Asia-based crude oil benchmark to compete with Brent or West Texas Intermediate futures. Well not much has been done except GST which is huge, which is a very, very big thing. I hope that they will privatize Air India. I'm not sure why that's such a big thing for Indians. It would be better for India, it would be better for Air India if they have to be efficient and competitive instead of being a protected industry and not offering a very good service to Indians and foreigners. GST is a miracle! I'm very surprised it went through and it's going to change India completely. In the long run it will make India cheaper and more efficient for most businesses, it's great for India and I'm very, very surprised. I'm looking for ways to invest in the eventual unification of Korea. One of two things is going to happen. There's going to be a war and that's the end of North Korea, the whole Korean country will be unified and will be a great investment or it's not going to be a war and there's going to be a peaceful unification eventually. Either way a unified Korea is going to be the most exciting country in the world for a decade or two. It's right on the Chinese border, 80 million people with cheap, disciplined, educated labor in the north plus lots of natural resources, fabulous infrastructure, capital, management ability in the south. It's going to be a very exciting country! I first went to Russia in 1966 as a student and I came away saying this will never work and came away bearish for the next 48 years. But now I'm very, very bullish on Russia. If I just told you about an asset that went from zero to two thousand in nine years and this chart all went straight up you would say to me whatever that is "it's a bubble it looks like a bubble". Maybe it's not a bubble yet but it looks like a bubble in formation if nothing else. Graphene, according to scientists, is going to be as important to the world as scientists. I did not say that, but scientists say it. It is thinner than paper and stronger than steel and they can even use it to purify salt water. I have been bullish on graphene for a long time, and all of a sudden an entrepreneur in this space shows up, he has been in this business for a while, and therefore I put in some small amount of money. I'm not sure you should ask me because I have never bought one Bitcoin. If I were smart, I would have bought them nine years ago, seven years ago, five years ago or even five months ago. So I don't know. If I just showed you charts of what's going on and described without telling you which country or which time periods, you would say "Oh, that looks like a bubble, sounds like a bubble." It does! But don't ask me because I missed the whole thing. I have never owned any cryptocurrencies and I say that with great embarrassment, I wish I had, obviously. But now there are two thousand of them up from nothing a few years ago. This is what bubbles feel like. In this podcast Jim Rogers discusses bitcoin and cryptocurrencies. 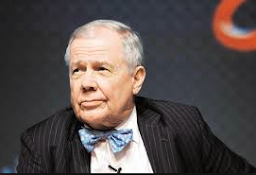 Jim Rogers discusses on Fox Business how the Trump tax plan will affect the stock market if at all. I don't own any crypto currencies, I never have owned any crypto currencies and I say that with great embarrassment. I wish I had obviously but now there are two thousand of them from a few years ago. I mean this is what bubbles feel like, look like and sound like as you well know. So is it a bubble? I don't know but it looks like it, it feels like. You look at the charts of Bitcoin and the others, I mean they could look like any other bubble, they all look the same, all bubbles throughout history have looked and felt the same. I'm certainly not buying any now. I'm not buying gold (SPDR Gold Trust ETF (GLD)) Sugar would be a better buy here then gold (SPDR Gold Trust ETF (GLD),), agriculture would be a better buy and Russia (Market Vector Russia ETF Trust (RSX)) would be a better buy. I have never owned any cybercurrencies and I say that with great embarrassment, I wish I had, obviously. But now there are two thousand of them up from nothing a few years ago. This is what bubbles feel like. The collapse in 1987 happened on my birthday and I was short the market so it was probably the best birthday party I have ever had.